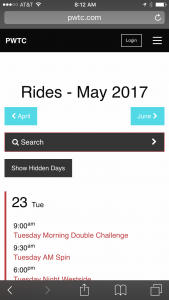 ADDING THE RIDE CALENDAR ICON TO YOUR SMARTPHONE Have you missed Patrick’s app for the PWTC ride schedule on your smartphone since we went to the new website? Well, it’s easy to install an icon on your home screen that does the same thing. For iPhones, bring up Safari and search for the PWTC website. Then navigate to the ride calendar going to the menu item Rides/Calendar or by scrolling down below the upcoming six rides and clicking on More Rides. Once you have the calendar on your screen, press that little box with the arrow at the bottom of your screen. One of the options will be a square with a + sign that reads Add to Home Screen. On the next screen you can change the name of your icon to PWTC or Rides or whatever you like. For Android phones, it’s slightly different. Go to Chrome. Find the PWTC website. Use the menu to go to the calendar or scroll down to More Rides. Press the three upright dots at the right of the screen, and when you see the menu, go to Add to Home Screen. When you get to the next screen, you can change the name to PWTC or Rides or whatever you like and press add. Voila!. You will receive an email prompting you to create a new password. If you have problems creating the password, contact Cindy at webmaster@pwtc.com or click on Contact and complete the form. CANCELLATION OF RIDES Ride leaders now have the ability to cancel a ride on the pwtc.com calendar. Only the ride leader for a particular ride will be able to cancel the ride. If you plan to attend the ride and the weather is inclement, you will see a red strike out through the name of the ride both on the home page and on the ride calendar. On the ride description, you will also see “This ride has been cancelled.” For directions for ride leaders, see the Ride Leader Info page. CHECKING YOUR MILEAGE STATS If you are a PWTC member in good standing, our mileage statistician records your mileage for club rides. You must be logged onto the website to view your mileage. From the Members menu (a drop down menu on the right under your profile picture), click on Rider Mileage. The first paragraph will show your name, your rider number, how many miles have been recorded year-to-date for you, your last year’s mileage total, and your lifetime total. Family members will need to first be added to the main account member profile, then logged in. ADDING A RIDE TO YOUR SMARTPHONE’S CALENDAR You can now add a scheduled ride from the PWTC Ride Calendar to your smartphone’s calendar app (such as Google Calendar). From your smartphone browser, open the PWTC Ride Calendar, pwtc.com/scheduled_rides. Click on the desired ride to open the description and scroll to the bottom of the page, below the start location map. 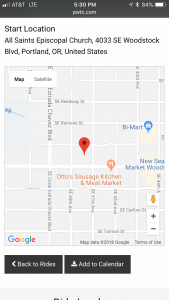 Click the “Add to Calendar” button. If you are asked how to open the file, select your calendar app.